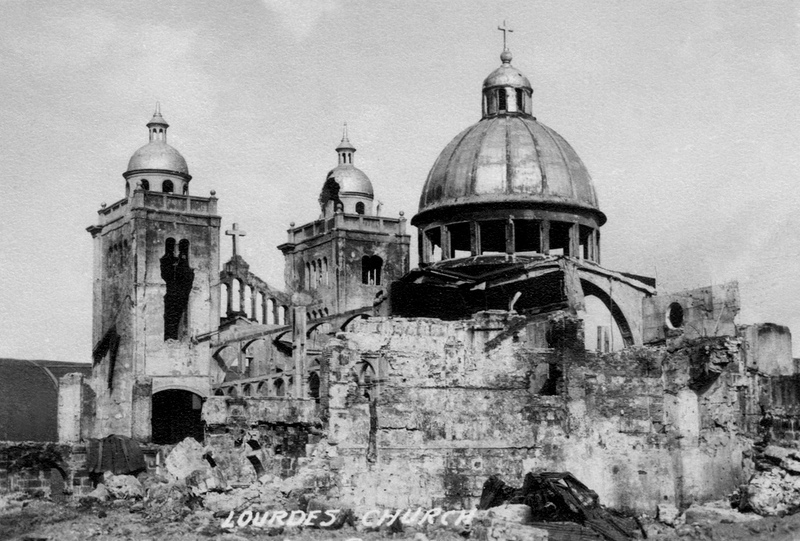 Ruins of the Capuchins' Lourdes Church in Intramuros after the Liberation of Manila, 1945. 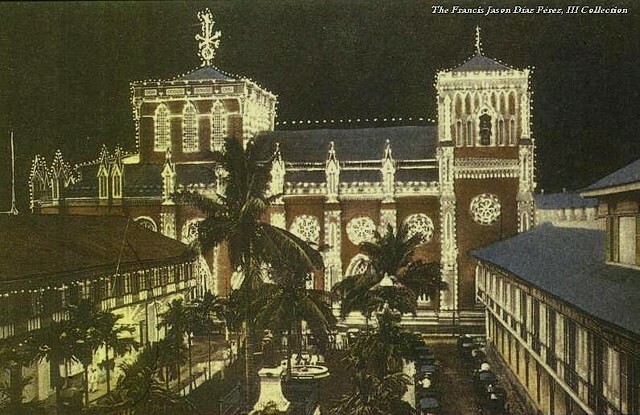 Jewel of the Dominicans, the Santo Domingo Church. 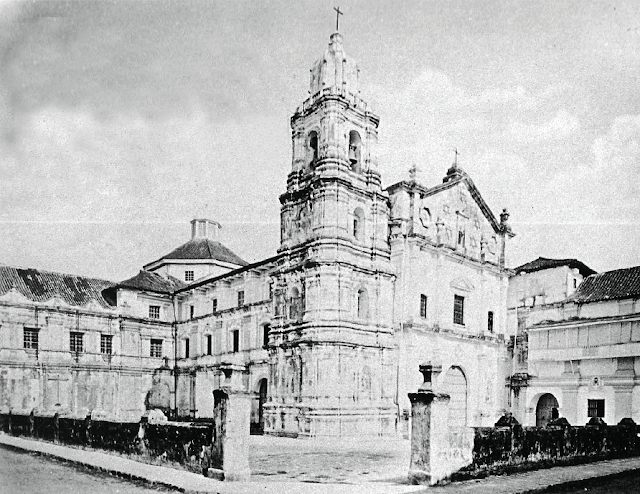 The magnificent Santo Domingo Church was the mother church of the Dominican Order in the Philippines. The Dominicans were the third religious Order to come to the islands in 1587. 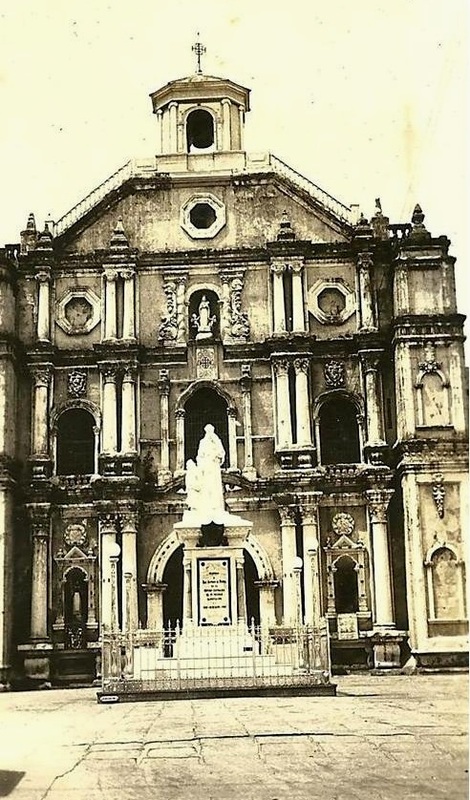 The Santo Domingo Church hosted the feast of the Our Lady of La Naval de Manila, and it has been said that the Spaniards' victory over the Dutch was attributed to her divine intercession. In 1611, Fr. Miguel de Benavides, a Dominican priest, established the University of Santo Tomas. 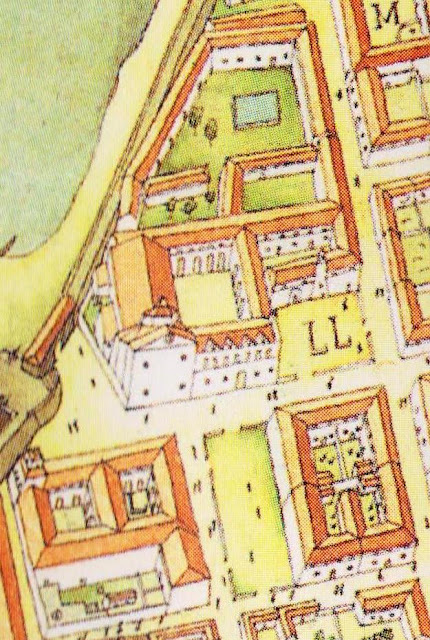 1713 illustration of the Dominican Complex. University of Santo Tomas on the bottom left and Colegio de Santa Rosa on the right. 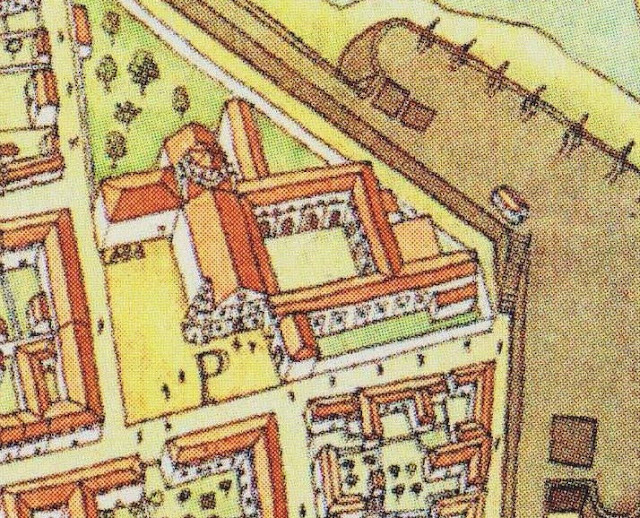 Notice that Plaza Santo Tomas was not yet formed. 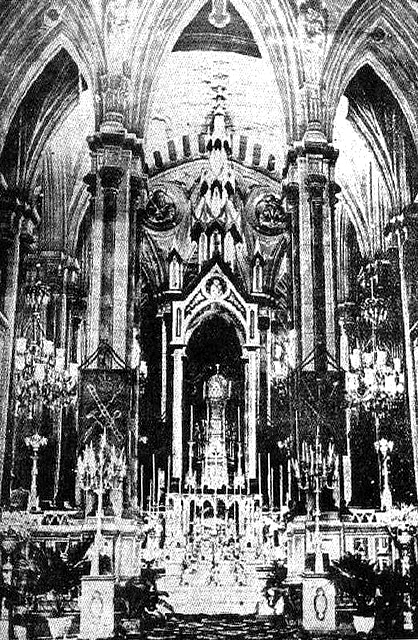 The Neo-Gothic church was actually the fifth church to have been built in the same spot since the Dominican's arrival. The previous churches were destroyed by either earthquakes or fires. The first church built in 1588 lasted only a year. The second church was made of stone and was inaugurated in 1592 but it burned down in 1603. A third church with stone vaults was constructed but again, collapsed during an earthquake in 1610. 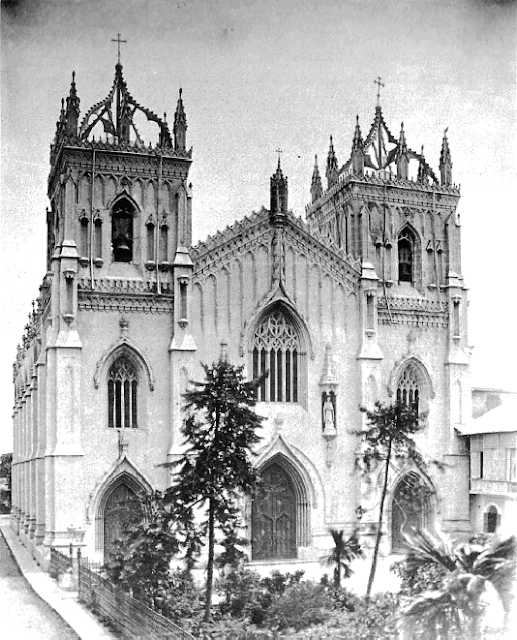 The construction of the fourth Santo Domingo Church immediately started. The fourth church remained standing for almost 200 years. 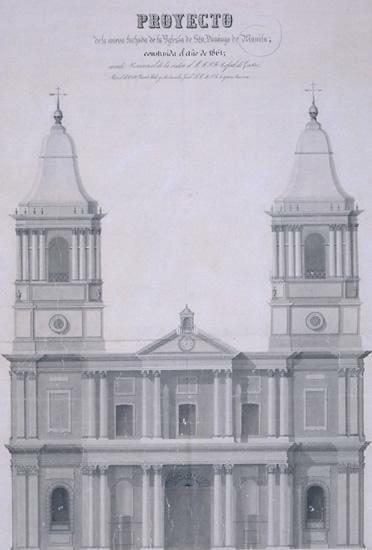 On June 1862, the church sported a new Neoclassical facade patterned after Christopher Wren's St. Paul's Cathedral in London. After a year, the church collapsed again because of another earthquake, destroying the church and its new facade. 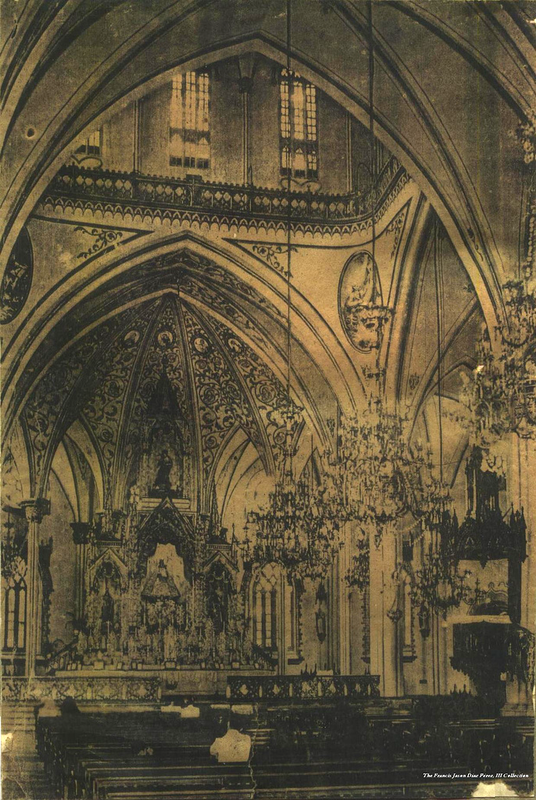 1868 church designed by Felix Roxas. 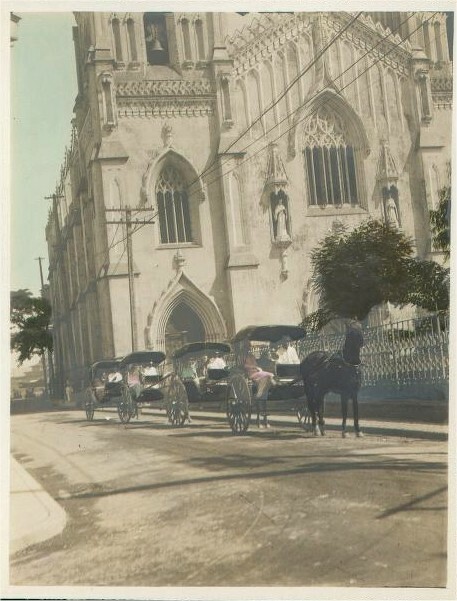 Santo Domingo Church, Intramuros. Notice the different, simpler roof design of the towers. The fifth and last church to have been built on the site was the masterpiece of Filipino architect, Felix Roxas. He then went on to design another Intramuros church, the San Ignacio Church, just a few blocks away from Santo Domingo. As a precaution against earthquakes, the upper floors of the church was made of wood and steel, resting on a lower story of stone. Construction started in 1864 and was inaugurated in 1868. 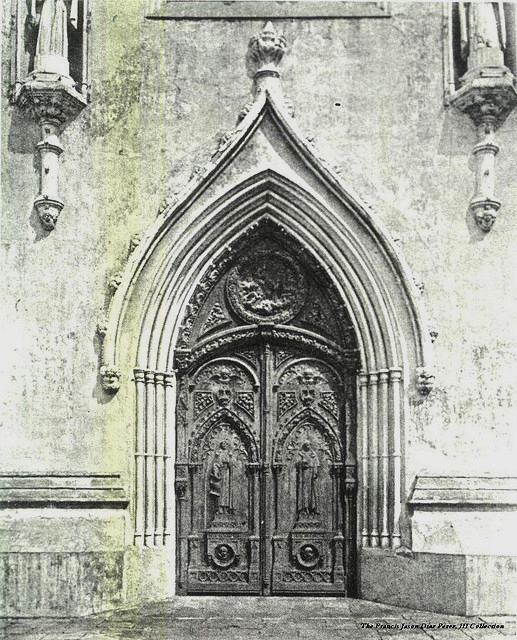 Church's intricate wooden entrance door. 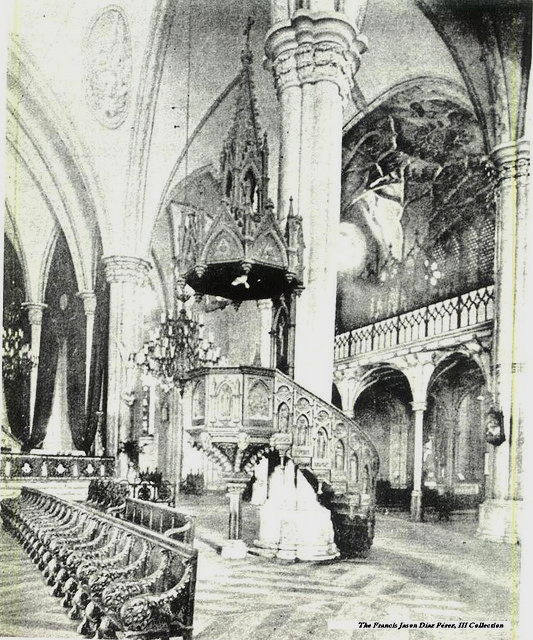 "The Gothic idiom adapted throughout the church was evident in both the exterior and interior-lancet windows, tracery, even the altars and the furniture were embellished with Gothic motifs." 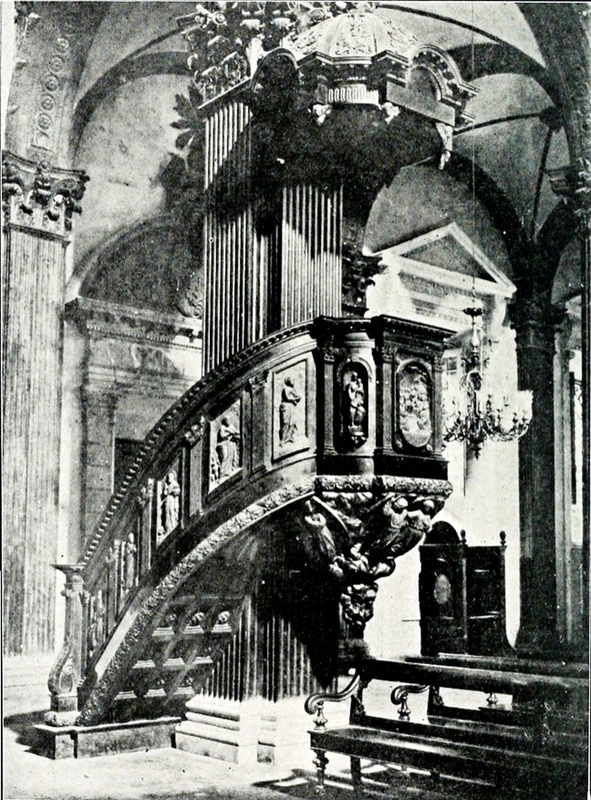 Church's pulpit carved by renowned Filipino sculptor, Isabelo Tampinco. "Its dramatic façade was the subject of many reviews precisely because of its grandeur and magnificence. Supported by two rectangular bell towers towers, the main façade boasted of arched, Gothic windows and several niches, one of which, housed the very first wooden image of Our Lady brought by the Dominicans from Mexico in 1587. Accentuated by lancet windows and tracery, the facade achieved a distinctly Gothic aura that was also well-reflected in the church’s amazing interiors. 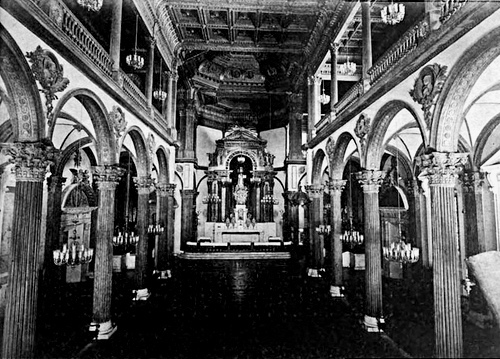 Inside the spacious church, one would have noticed the black-and-white tile flooring of the church and the spiraling columns of the church. The materials used for the columns were “carved from molave, acle and ipil wood. 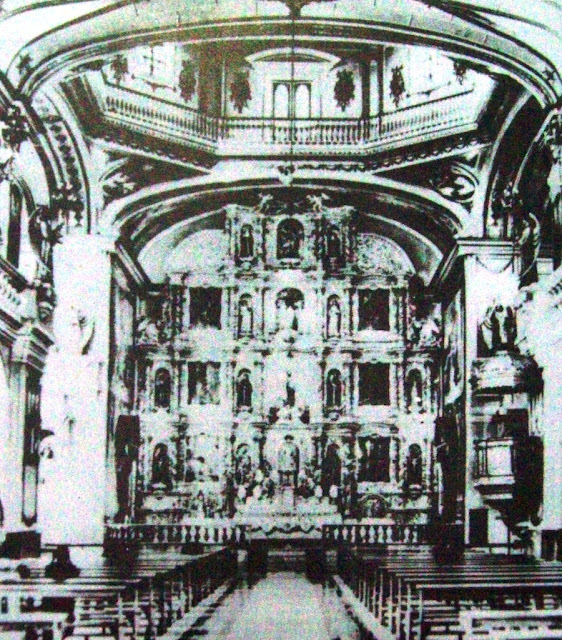 The vaults were made of zinc and galvanized iron with batikuling moldings.”"
View of the retablo mayor from the nave. Retablo mayor of the Santo Domingo Church. Showing the church's impressive interior. "But of course, nothing would be more impressive in any church than its main retablo. Likewise, Sto. Domingo’s large main altar didn’t fail to impress and vivify the congregation. The main altar would boast of thousands of lit candles during solemn rites and was really a treat to see. There were four niches inside the Gothic retablo: one in the center, one at its left, another at its right and one on top of the central niche. The saints that occupy these niches would usually be interchanged. The main altar was wide but also dramatic in its slope ascending to the ceilings. 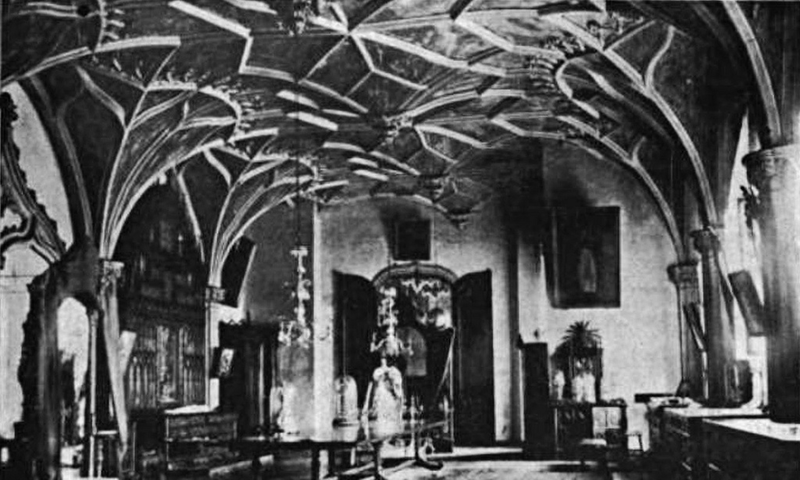 Accentuated with pointed details and arches, it was the gem of the church. The main retablo of Sto. 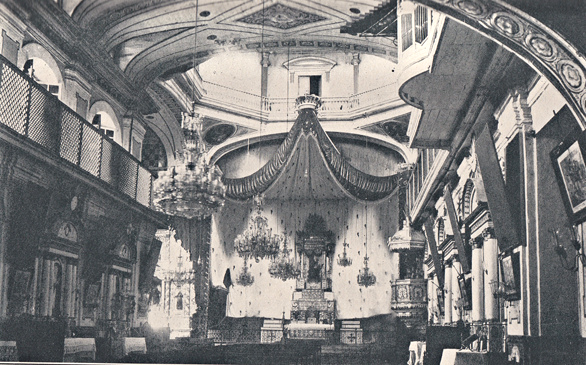 Domingo was also said to have most number of gold and silver ornaments among all of Intramuros’ churches." Calesas passing by the Neo-gothic wonder. View from Plaza Santo Tomas. 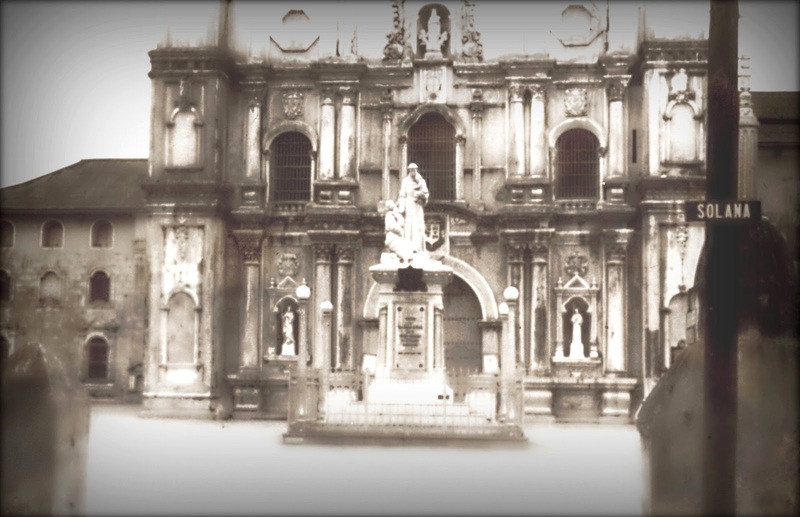 Another view from Plaza Santo Tomas showing the statue of Fr. Benavides, founder of the University of Santo Tomas. 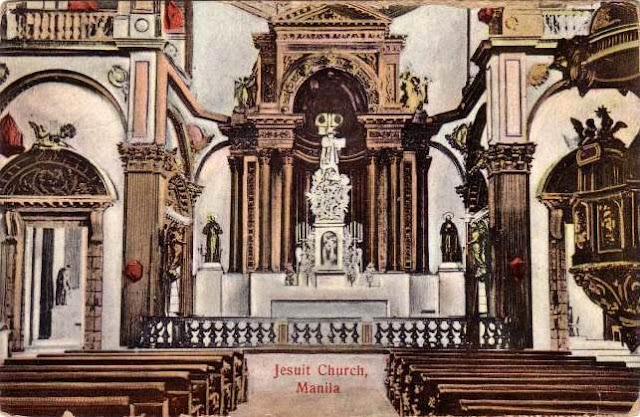 Colored postcard showing a fully lit church, probably during the Feast of the Our Lady of La Naval de Manila. University of Santo Tomas on the left, Colegio de Santa Rosa on the right. Reminds you of some medieval European city, no? View from the back. Aduana on the left. The Santo Domingo Church was another casualty of World War II. 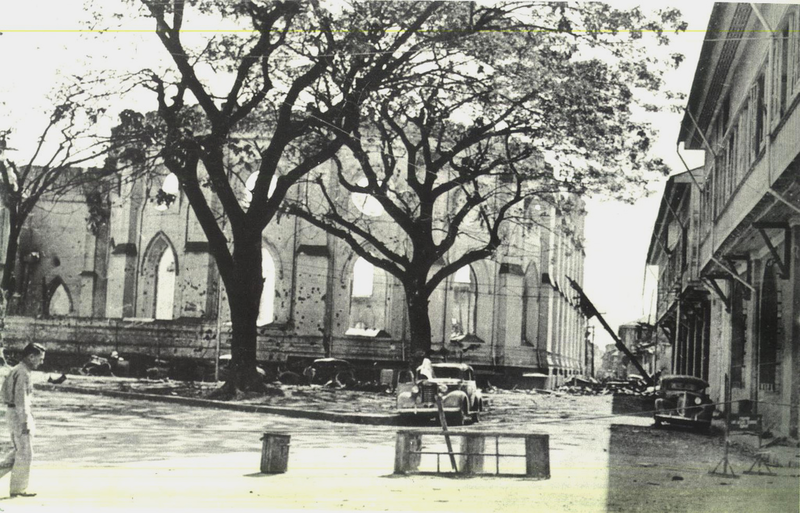 In fact, it was the first structure in Intramuros that was destroyed by Japanese bombs in 1941. The Our Lady of La Naval de Manila was spared because it was hidden in one of the church's vaults. 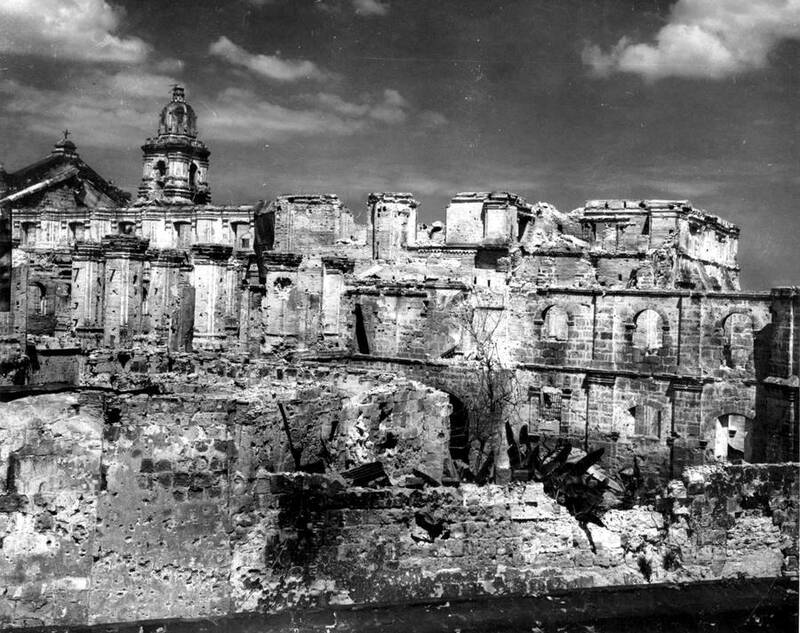 Ruins of the Santo Domingo Church after the war. 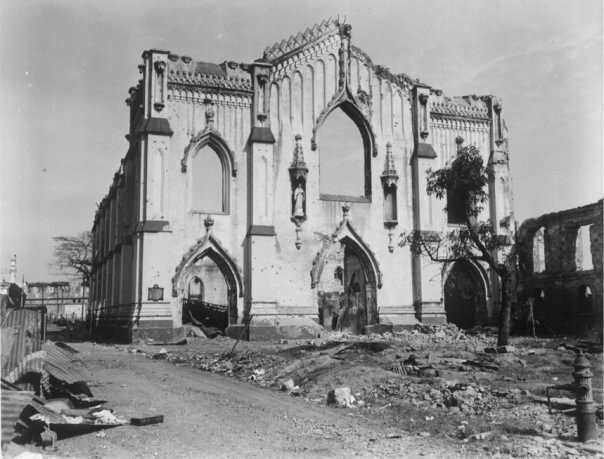 The church in ruins after the 1941 bombing by the Japanese. 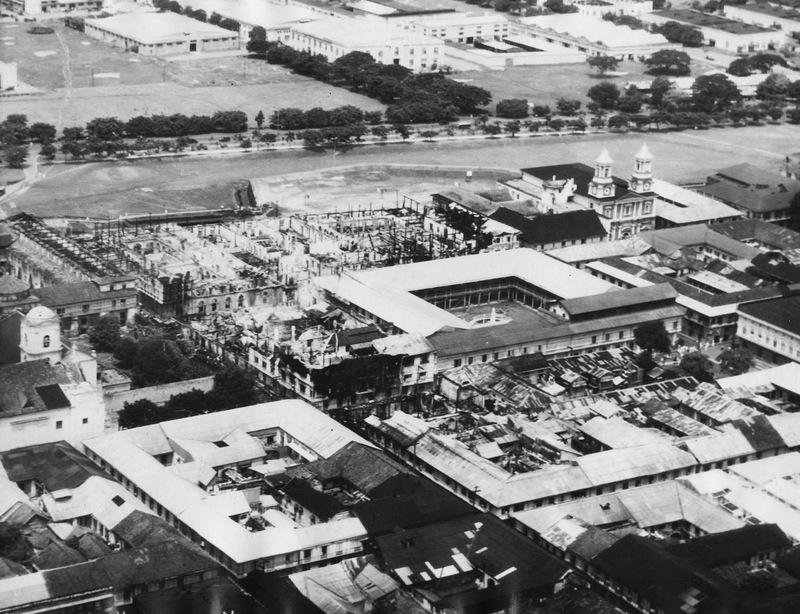 Notice that the University of Santo Tomas and other buildings on the right are still standing. War torn University of Santo Tomas, Santo Domingo Church and Colegio de Santa Rosa after the Liberation of Manila, 1945. The statue of Fr. Benavides survived and was transferred to the present UST campus. 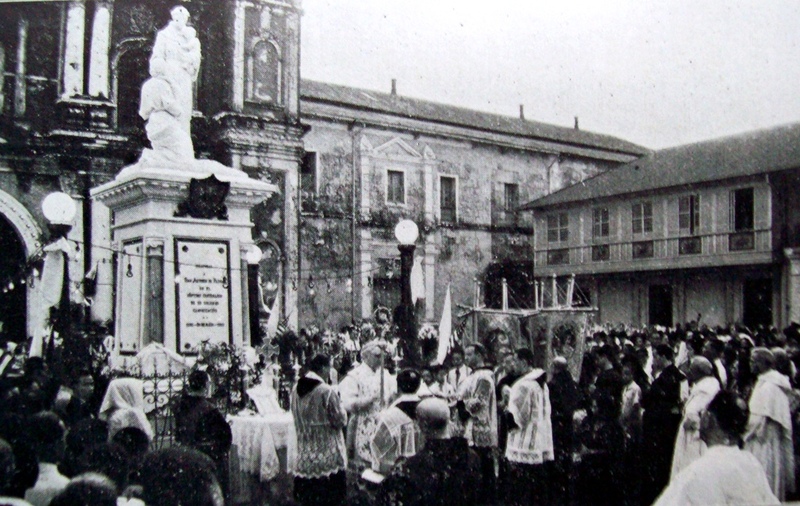 Today, the Dominicans reside on the grounds of the new Santo Domingo Church (1954) in Quezon City. The grounds of the church is now occupied by an ugly box building of the Bank of the Philippine Islands. 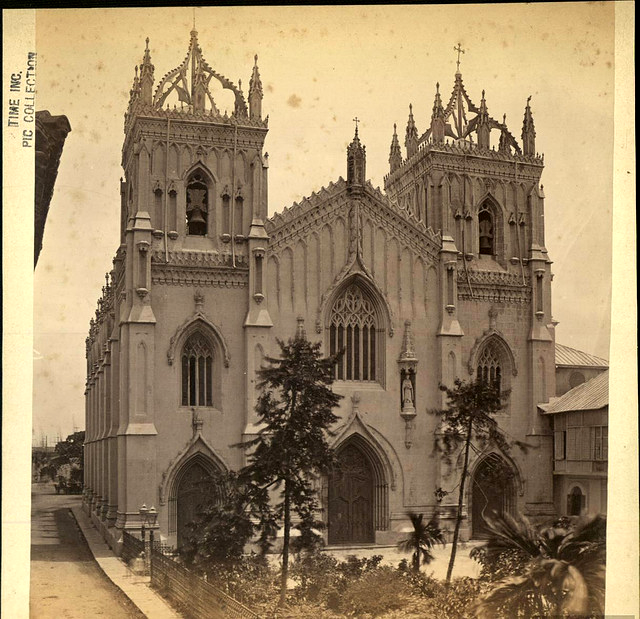 Special thanks to http://hechoayer.wordpress.com/ whose entry about the Santo Domingo Church has helped me write this entry. Intramuros fire of August, 1932. The fire damaged the Augustinian Convent, Ateneo Municipal de Manila, and a portion of Santa Isabel College. 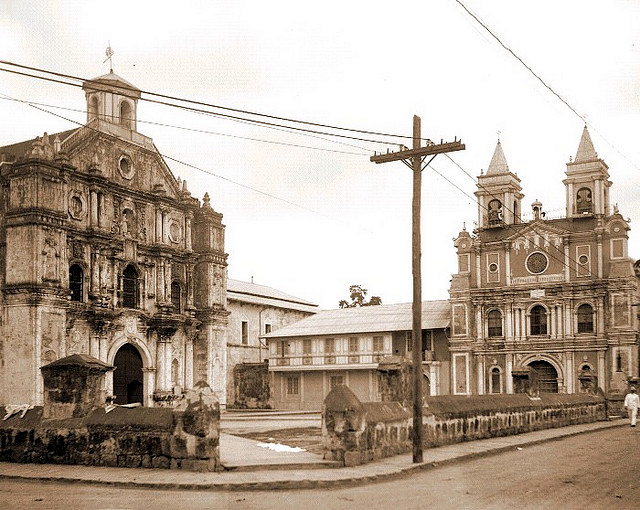 The tower of San Agustin Church can be seen on the left and San Ignacio Church on the upper right of the picture. The Jesuits' pride, the San Ignacio Church. Imagine if you were an Atenista and then you'd have your first communion, confirmation and even your graduation in this church. Oh, that would have been such a delight! The San Ignacio Church was the source of pride and inspiration for the Society of Jesus, or more commonly known as the Jesuits. It was the Jesuits' "sueno dorado" or their golden dream. Manila's most skilled architects, artists and even workers shared one common goal to build something so majestic that significantly featured Filipino artistry and talent. San Ignacio Church, view from outside the walls. 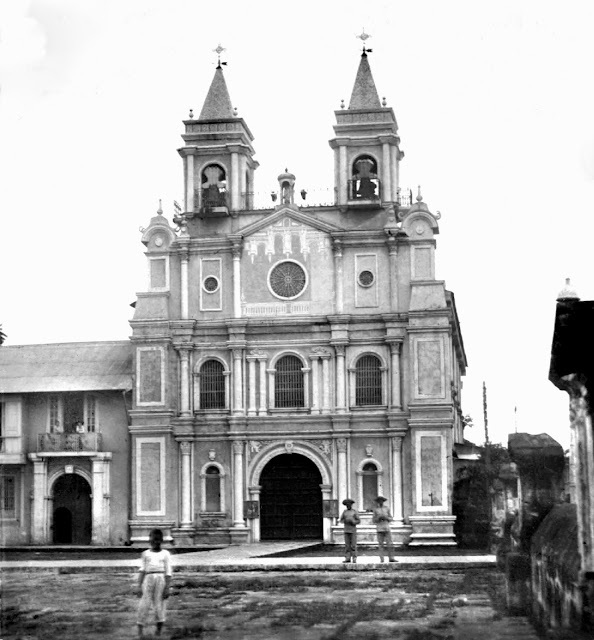 This church replaced the La Compañia, the Jesuits' first church which was located on a different lot in Intramuros. The expulsion of the Jesuits from the Philippines and other Spanish colonies in 1767, left the La Compañia abandoned and soon after, it deteriorated and was destroyed. When the Jesuits returned in the 1750s, it took them some time to construct a new church in a new lot. 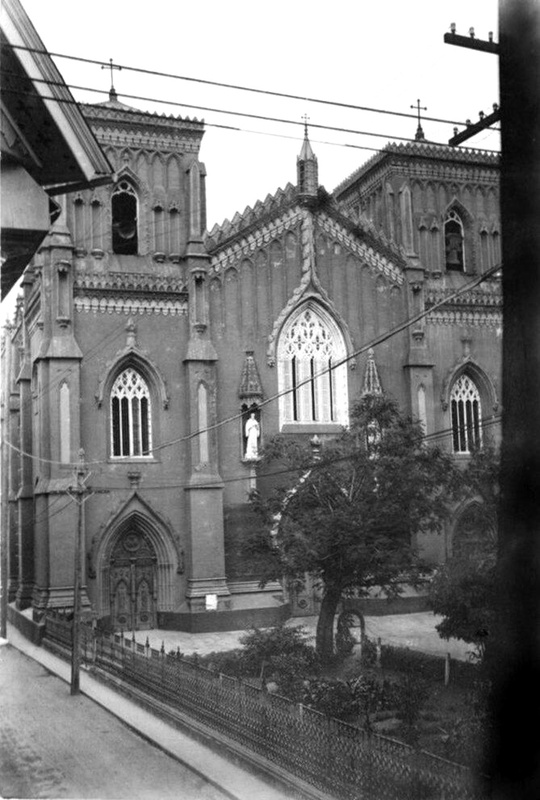 Building of the new church started in 1878 and completed, inaugurated and concentrated in 1889. 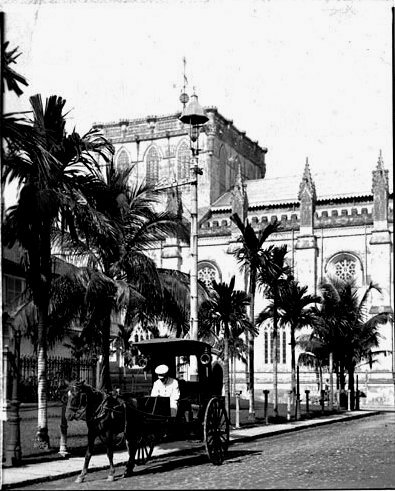 Positioned along Calle Arzobispo, the renowned church was in the Neoclassical and Renaissance style. It had a very graceful facade and an interior beautifully decorated and richly clad with wood carvings that came from the forests of Surigao. There is a remarkable amount of metal structural elements which gives it an air of modernity, although the general design continued to follow the classical style. Designed by Filipino architect, Felix Roxas. Arch. Roxas "opted for a church Classical and Renaissance in temper to allude to the times when the Society of Jesus was founded." 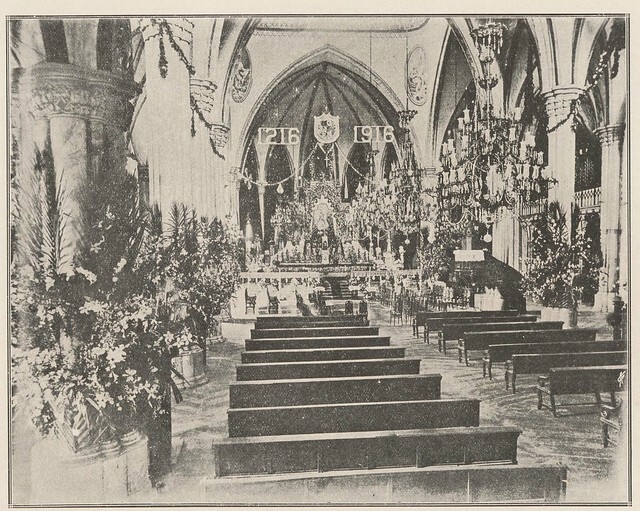 "The church was a celebration of Philippine art. From its architect, to the artists that decorated it and to the materials it was made of, it was a treasure chest of everything Filipino. San Ignacio was a source of pride for a country then beginning to develop a sense of patriotism. 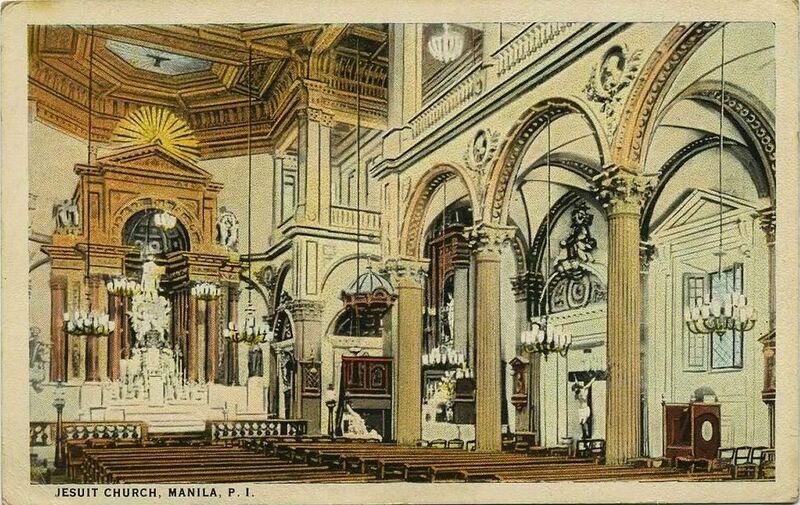 An obra maestra to the eyes of locals and foreigners, it was considered a must a see sight for any visitor in pre-war Manila, and even a popular wedding destination." San Ignacio's elegant facade. Wrought iron gates fronting Calle Arzobispo. Detail of the wrought iron gates. You can also see the bricks that make up the front facade. "The main element of the facade is the pediment. It is supported by four pairs of twin columns; the bottom columns are rendered in the Ionic order, while the top are in the Corinthian style. 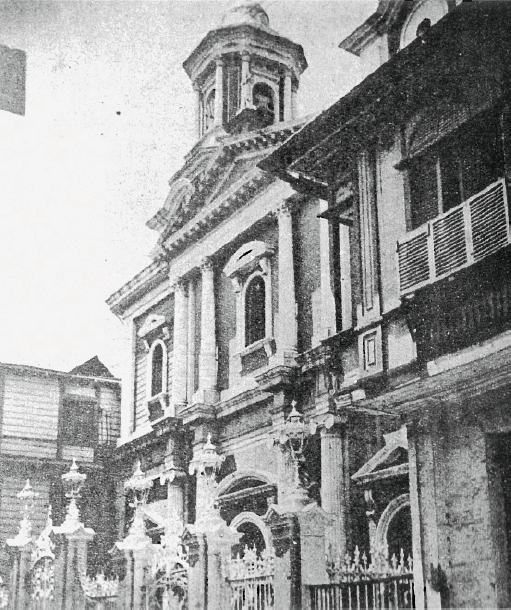 The use of twin columns in church facades has been described as distinctly Filipino. Flanking the pediment are graceful, twin towers. 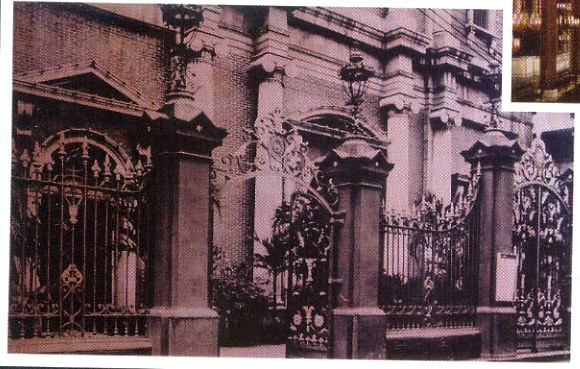 The walls separating the church compound from Calle Arzobispo are laced with wrought iron grilles and the posts are topped with ornate faroles. For the inside, he planned the church as a single nave flanked by wide aisles, above them run galleries to accommodate a more churchgoers." Rebulto mayor, showing the statue of St. Ignatius of Loyola, designed by Agustin Saez. Agustin Saez, a one time director of Academía de Dibujo y Pintura , an art instructor at the Ateneo Municipál de Manila and Dr. Jose Rizal's former teacher, designed the rebulto mayor and the famous pulpit of the church. For the pulpit, award-winning Filipino sculptor, Isabelo Tampinco, executed the masterpiece. 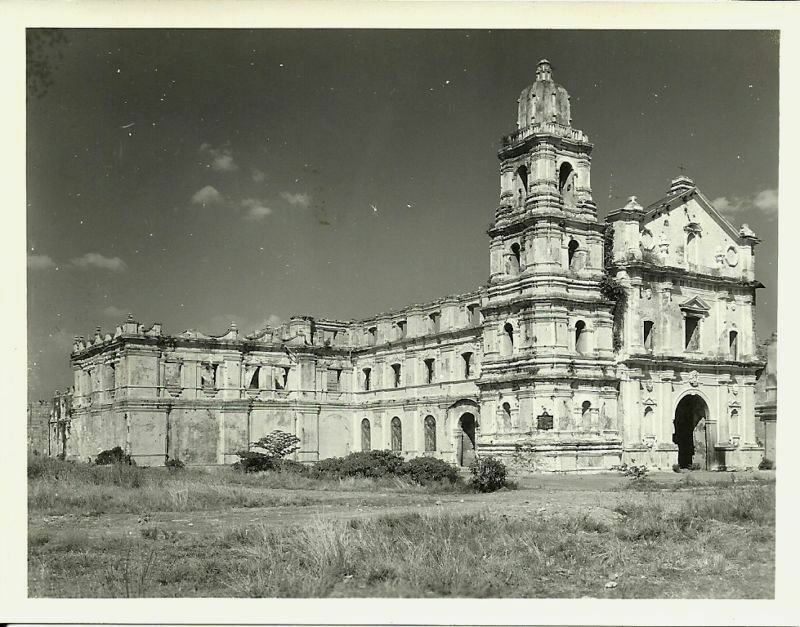 Upon its opening, the church boasted great craftsmanship and was the favorite among young Filipinos. 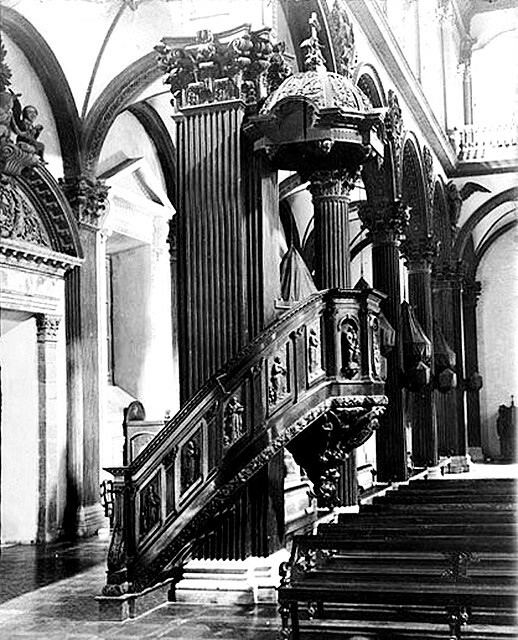 Famous pulpit, designed by Saez, carved by Tampinco. Another view of the pulpit. 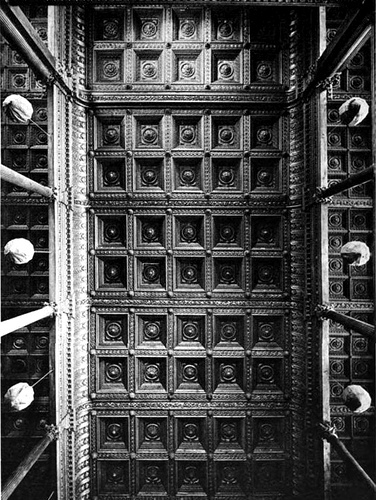 Ceiling detail of the altar, carved by Tampinco and his team. 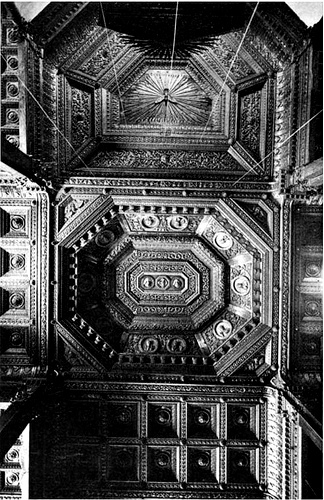 Ceiling detail of the nave, carved by Tampinco and his team. The church's beautiful interior was a sight to see. 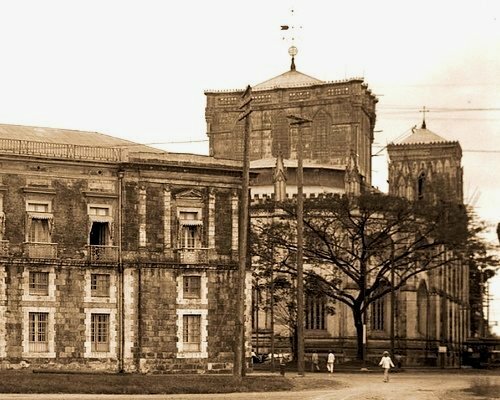 In 1933, the Ateneo Municipál de Manila burned down but fortunately, even with its close proximity, it did not do any damage to the church. 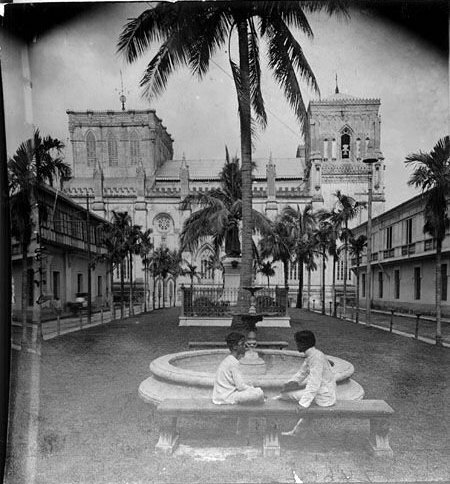 The Ateneo rebuilt its Intramuros campus for grade school and the rest of the campus moved to its new home in Ermita, Manila. Colored postcard of the altar. Yesssss, again, like all other churches in Intramuros, the church was a casualty of the Second World War and was razed to the ground by fire set by the Japanese. I read that the church burned for four whole days maybe because of the predominantly hardwood interiors. It was completely heartbreaking that something so beautiful and almost ethereal can be destroyed just like that. 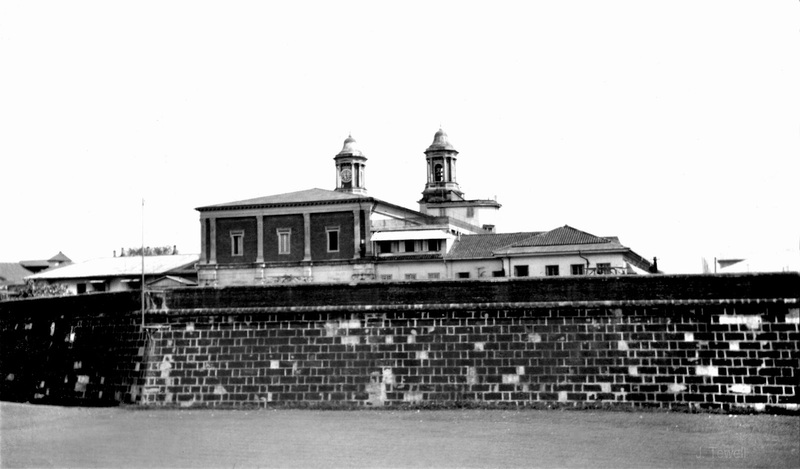 The Jesuits moved to Loyola Heights in Quezon City in the early 1950s. 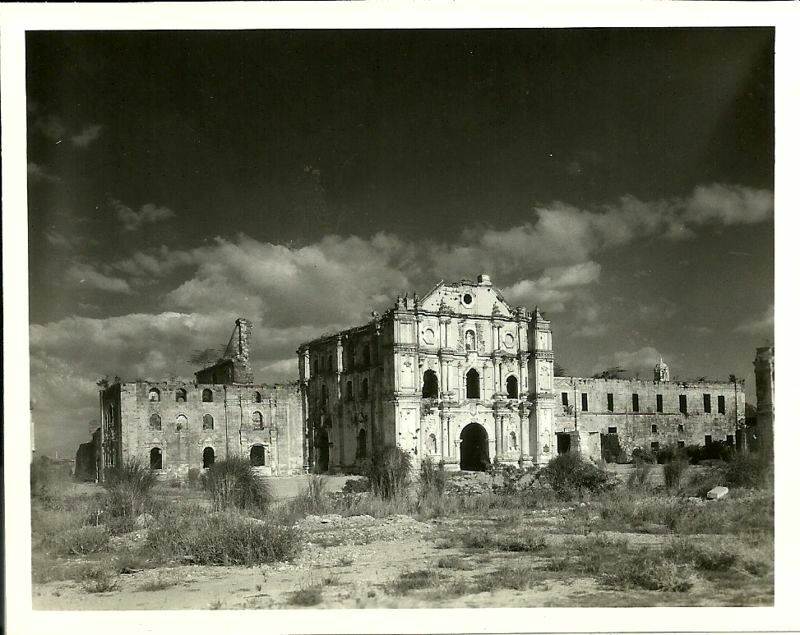 The old splendor of the San Ignacio Church remains a memory of the past. 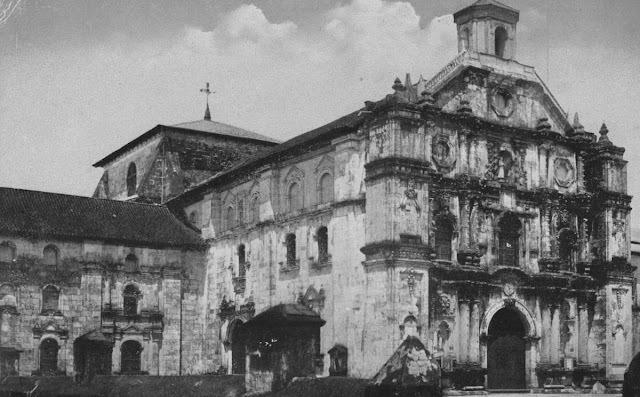 I believe that there's still hope for this church because unlike the many different churches in Intramuros, the ruins were not bulldozed and its shell can still be seen today. The ruins were already used as an office, a warehouse, an outdoor theater, etc. Rumors are circulating that they will rebuild the church, not as a church but as a museum. Good enough, I guess. The San Francisco Church was the mother church of the Order of Friars Minor (OFM), or simply known as the "Franciscans", the most prominent group of the Franciscan Order. Located along Calle Solana cor. Calle San Francisco, the church was considered as one of Intramuros' best. San Francisco Church, late 1800s or early 1900s. The Franciscans were the second religious Order to arrive in the country in 1578. They were welcomed wholeheartedly by the Augustinians. The first church, which was dedicated to the Our Lady of Angels, was built using bamboo and nipa materials. In 1583, fire struck Manila and destroyed the church. A new church made out of stone was constructed in 1602 but was severely damaged during the 1645 earthquake that rocked the city. It remained in ruins until the third church was built in 1738. In 1863, another earthquake damaged the church's roof and the capilla mayor (main chapel) and it had to be repaired. Some accounts say that the church had a bell tower but was damaged in 1824 because of another earthquake and it wasn't rebuilt. Perpendicular to the church is the Chapel of the Franciscan Venerable Third Order. Statue of St. Anthony of Padua and the church's front facade. Original church marker from the Historical Research and Markers Committee, 1935. "This church had a retablo-like façade. decorated with superpositioned Ionic and Corinthian columns. Windows, niches with statues, balustrades completed the design. The church as it survived to the 20th century did not have a prominent bell tower, instead two protruding decorative piers flanked the façade." Devotees of St. Anthony of Padua gather in the plaza. Original plaque on the statue's pedestal. The church's plaza. Notice the street sign "SOLANA" on the right. The church was the home for the devotion to St. Anthony of Padua, patron saint of the poor. There was a statue of St. Anthony in front of the church facing the plaza. The statue is now located in the courtyard of the Sanctuario de San Antonio in Forbes Park, Makati. 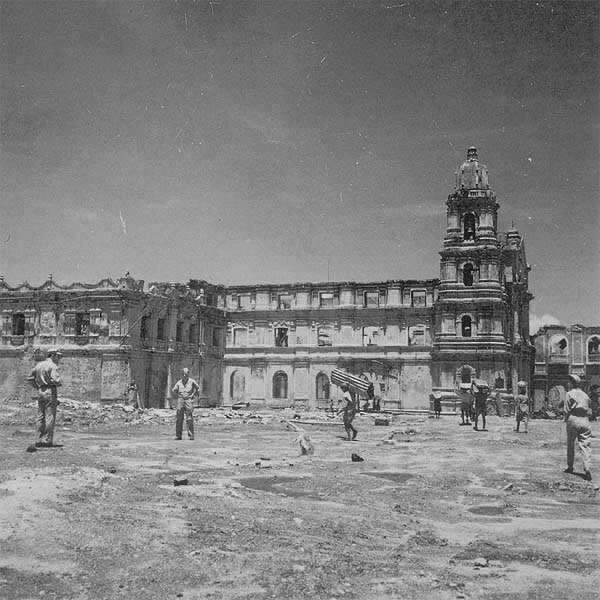 San Francisco Church destroyed after the Liberation of Manila, 1945. Yes, you've guessed it right! 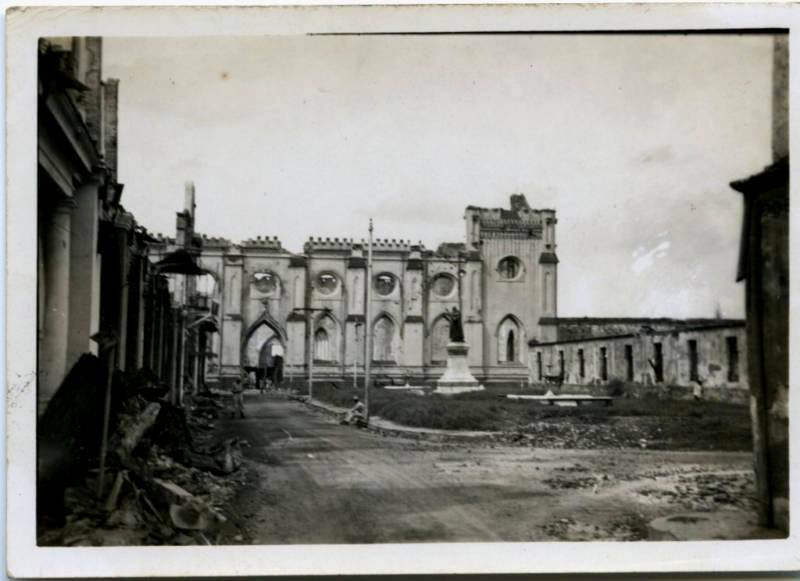 The church was badly damaged after the war and was not rebuilt. The shell of the church was still standing but it was bulldozed to pave way for future development. It's really unfortunate that they demolished the ruins because even if destroyed, the ruins looked majestic. 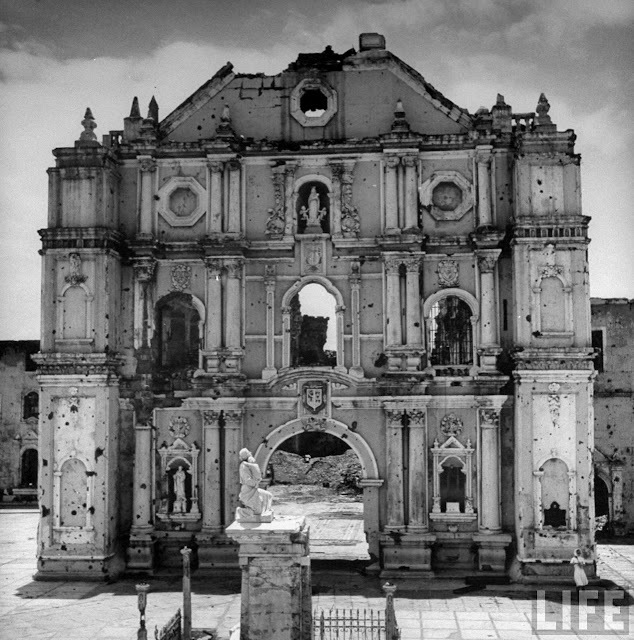 It should have been preserved like the ruins of St. Paul in Macao which is now a UNESCO World Heritage Site. The Mapua Institute of Technology presently occupies the site. The Franciscans found its new home in San Francisco del Monte in Quezon City. 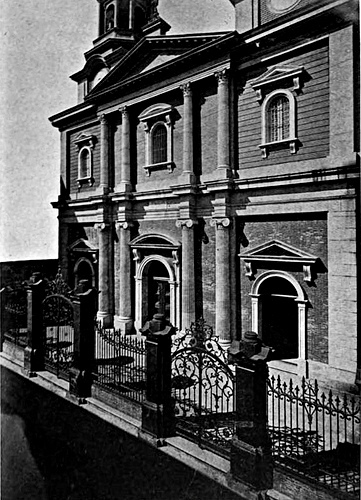 Front facade of the Chapel of the Franciscan Venerable Third Order, late 1800s to early 1900s. The Capilla de la Venable Orden Tercera was a church for the lay branch of the Franciscan Venerable Third Order (VOT). 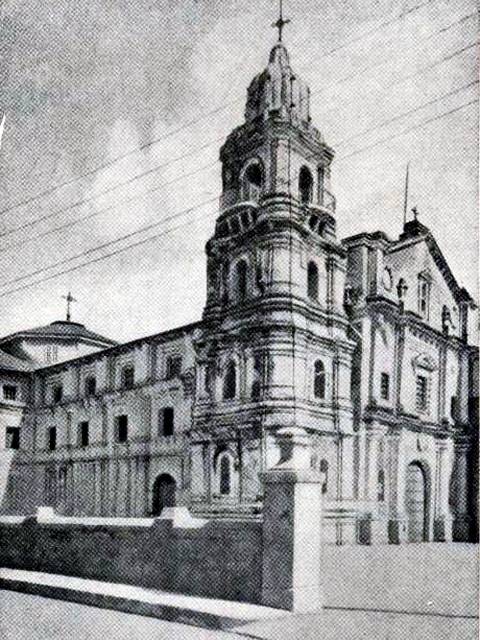 The church was built adjacent to the convent and perpendicular to the mother church of the Franciscans, the San Francisco Church. The original structure was just a small chapel completed in 1618. In 1723, expansion started and it finished in 1733 and was dedicated the following year. Located along Calle Solana, the Neoclassical church complimented its Baroque neighbor. The new church was dedicated to the Virgin Mary under the title, Immaculate Concepcion. Franciscan Complex, late 1600s to early 1700s. 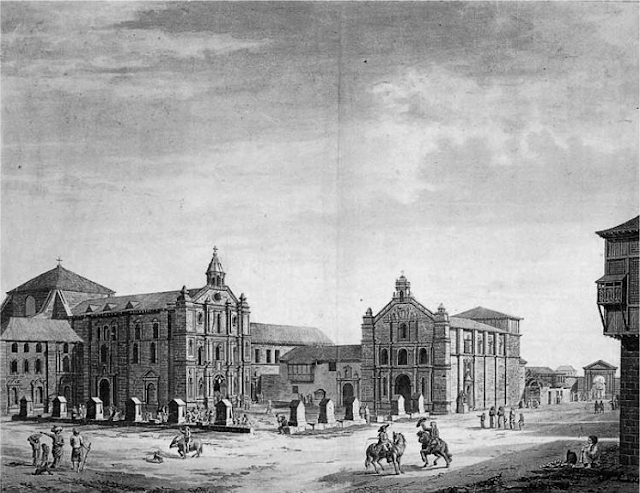 Notice the different facade of the chapel on the right, before the 1723 renovation. 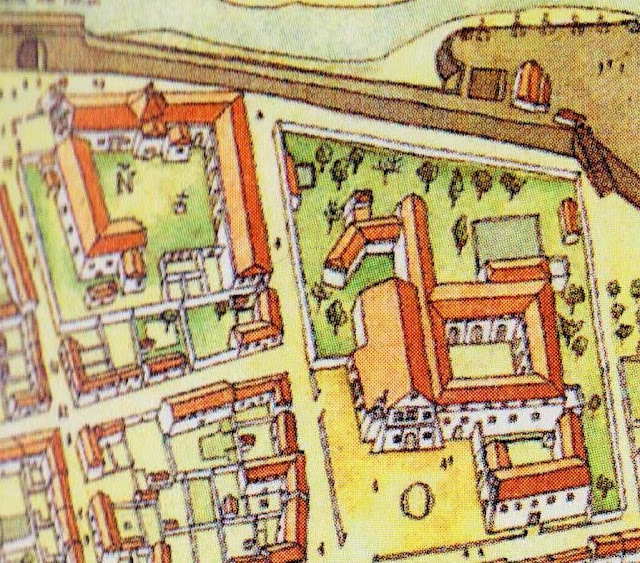 1713 illustration showing the Franciscan Complex (O). The plaza, San Francisco Church and the Chapel of the Venerable Third Order. 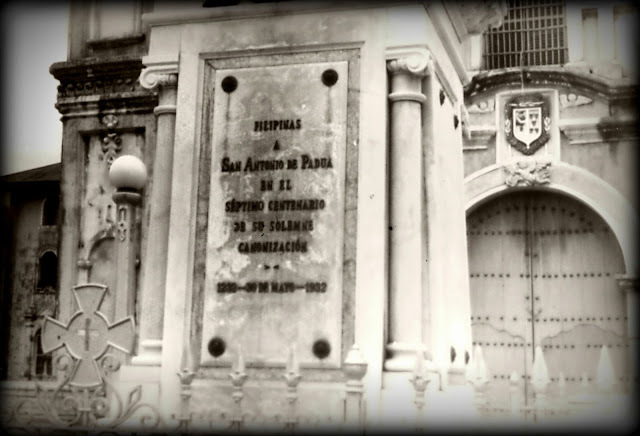 The nearby San Juan de Dios Hospital (N) is also seen near the Parian gate. The chapel was a casualty of WWII. It was heavily damaged and was not rebuilt like many other buildings in Manila. 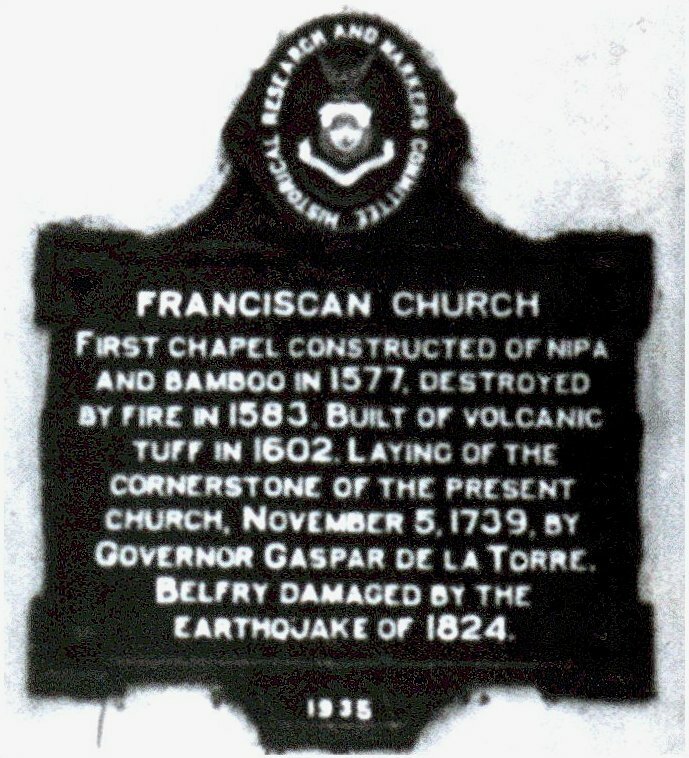 The Mapúa chapel now stands on the site. 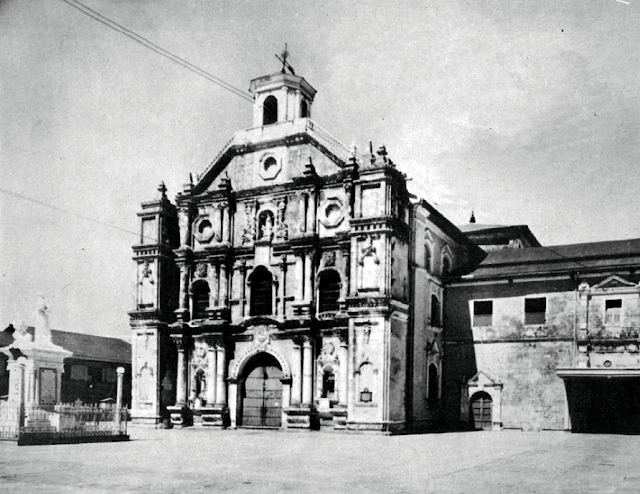 The Iglesia de San Nicolas de Tolentino was the home of the Augustinian Recollect Order. The church was the Order's main headquarters in Asia. The Recollects are a reformed branch of the Augustinian Order. They arrived in Manila in 1606. It formerly housed the Nuestro Padre Jesús Nazareno or more commonly known as the Black Nazarene. Yes, the Black Nazarene as in the one in Quiapo today. The Recollects brought it to the country in 1606. 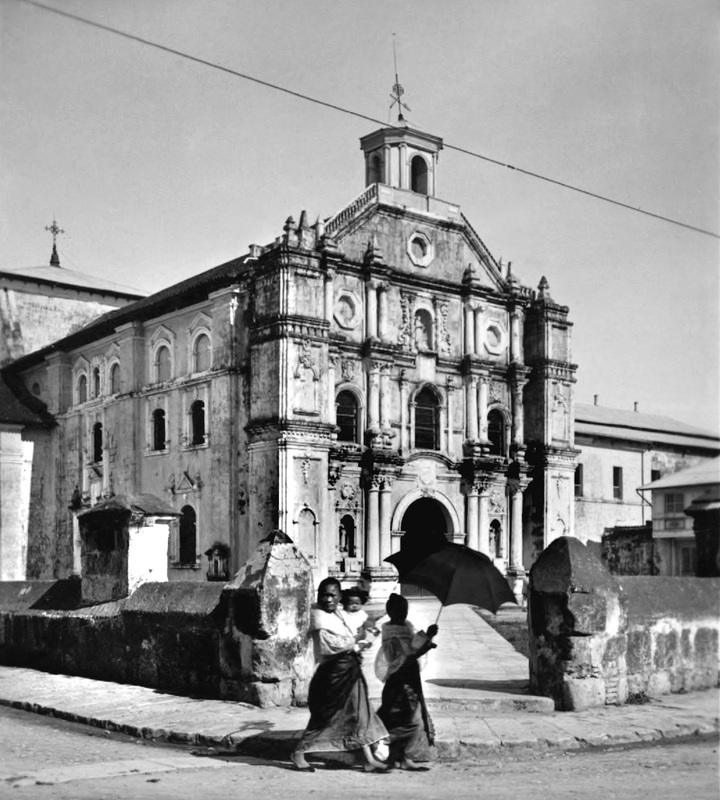 The church was known for its stately ambiance, often compared to its neighbor, the San Agustin Church. "This late 18th-century church was characterized by a four-story bell tower of diminishing dimensions built to the left of the church. The church was cruciform, with a crossing tower covering the intersection of main nave and transept. The church facade was similar in temper to the Franciscan’s but less the ornate and more architectural. It was the church interior, however, that distinguished the church. 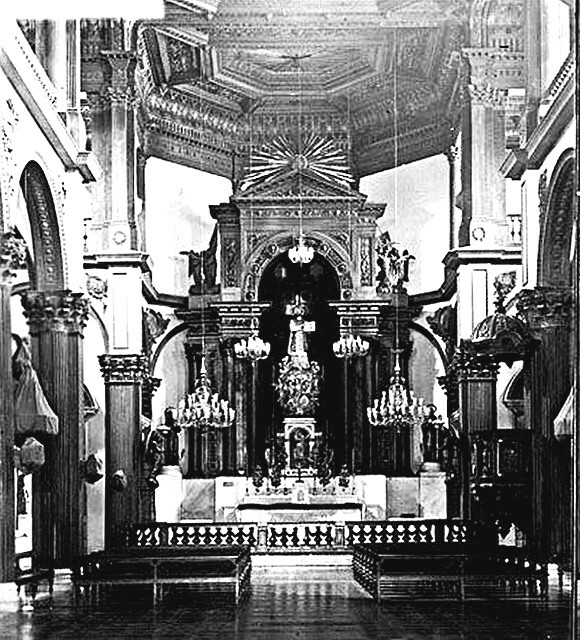 The main altar was in the Baroque style. Divided into niches and stories, the gilded retablo alternated images and painted canvases. In this church, the famous Recollect organ builder, Fray Diego Cera, who built the Las Piñas bamboo organ, constructed his masterpiece. 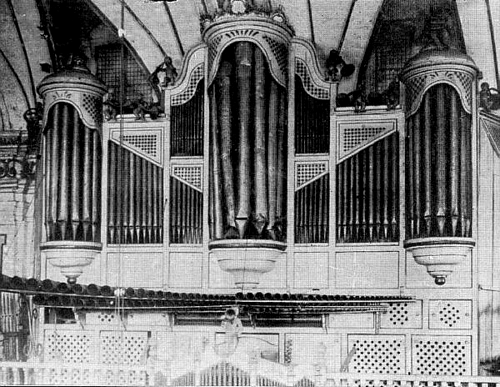 He built a massive pipe organ, outfitting the nave with pipes some ingenuously hidden so that when sounded, the walls itself seemed to sing.In the 19th century, the church walls were painted with figurative drawings. One on the transept walls depicted the Pope and St. Peter’s in Rome." Again, this church was heavily damaged because of the Second World War. The Black Nazarene was transferred to the Quiapo Church and the Augustinian Recollects moved out of the walled city and found its new home in the San Sebastian Church also in Quiapo. After the liberation, the church's ruined shell was still intact but in 1959, it was totally demolished. In 1976, Manila Bulletin bought the lot and set up their offices there.